Now, to the down and dirty: Why start a blog? I've been following bloggers for several years and I love reading about all sorts of stuff -- beauty, fashion, food, traveling and life in general. You name it -- I've read it. For the past eight months, I've been writing journal entries on one of those websites that helps to spread news to family and friends. 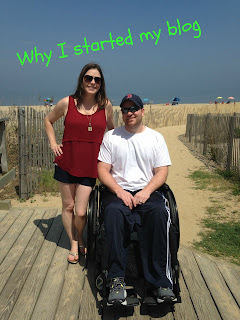 About a week after my husband's accident, my sister suggested a few different websites and before I knew it I was posting entries on a daily basis. That website literally saved me! It helped to decrease my stress and the number of phone calls I made on a daily basis. Now with a few keystrokes, I communicate my husband's status with hundreds of individuals. Many of our "followers" have mentioned how much they enjoy reading my updates and have made reading my journal entries a part of their daily routines. It's hard to believe we have so many people reading about my husband's progress and praying for us. We are truly blessed to have each and every one of them. In fact, we recently took a vacation and someone asked my mother-in-law: "I haven't seen a post in about a week, is anything wrong with S & Jenny?" She kindly informed them we were on a much needed vacation and that I'd be back at it soon enough. With that said, I've started this blog for a reason. Over the past year, a lot has happened and since I've been out of work and taking care of my husband -- I figured why not express my thoughts and feelings with the hope of helping people and connecting to people with similar interests? I look forward to writing about my passions -- food, wine, fitness, furry friends, and life out west. Fellow bloggers -- What were your reason(s) for starting a blog?